It has been a long time since the loud voices and footsteps of boisterous boys rang through 1 Francis Thomas Drive, but its hallowed halls are still fondly remembered by St Andrew's alumni. The former premises of the St Andrew's family of schools in Potong Pasir is now home to the Diocesan Centre of Singapore, an Anglican organisation. Gazetted for conservation in 2003, the structure was restored in 2006, with the help of photographic records, school yearbooks and old boys' accounts. The schools moved out of the building in 1986, but later moved back to the same area into new buildings. Today, the area is known as the St Andrew's Village, a compound housing St Andrew's Junior School, St Andrew's Secondary School and St Andrew's Junior College. For many decades, the iconic clock tower at 1 Francis Thomas Drive was the tallest structure in the area, says Mr Kelvin Ang, the Urban Redevelopment Authority's director for conservation management. The building was designed in 1939 by British architect Frank Wilmin Brewer, who was also responsible for the Cathay Building in Handy Road. It originally had two storeys, but a third was added in 1952. Built in a style that Mr Ang describes as arts and crafts-meets-Spanish mission, the building is in a striking shade of salmon pink. He says: "The materials for this building are very simple and hard-wearing - terracotta tiles, plaster and brick. I think boys' schools had to be boy-proof in the same way army camps had to be soldier-proof. "It's simple, but everything is very considered. It's not luxurious in any sense, but it's very well-proportioned and comfortable. "I think that's one challenge of building civic buildings - how to be sufficiently grand and imposing without being extravagant because the money comes from the community." The building's stuccoed outer walls feature a three-dimensional "fish scale pattern", which Mr Kelvin Ang, the Urban Redevelopment Authority's director for conservation management, speculates could have served the practical purpose of deterring lizards and snakes from climbing the walls. Another unique feature is the roof, which is covered in handmade terracotta tiles. "They are all slightly different in tonality," he says. "The shapes are quite organic - they're not like modern tiles, where every tile is the same. That gives it a very rustic look." The tiles also match the terracotta ones that pave the ground. In the centre of the four outer walls is a grassy quadrangle surrounded by arched walkways and classrooms. The walkways have a special feature: a line drawn down the middle to demarcate queues for students standing in line. 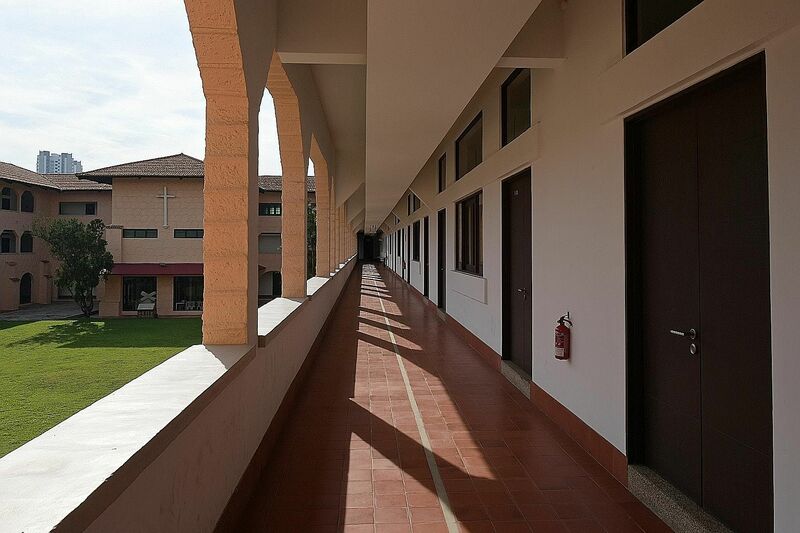 The design of the corridors, Mr Ang says, is reminiscent of army camps and hospitals built by the British in the 1930s. The chief aims of their architecture style, made for the tropics, were shade, shelter and ventilation. The classrooms are now used for church camps and the large halls, for worship services. Terracotta tiles helped lower the temperature in an era without air-conditioning. So did the use of green glass in the windows, even if the effect was chiefly psychological. 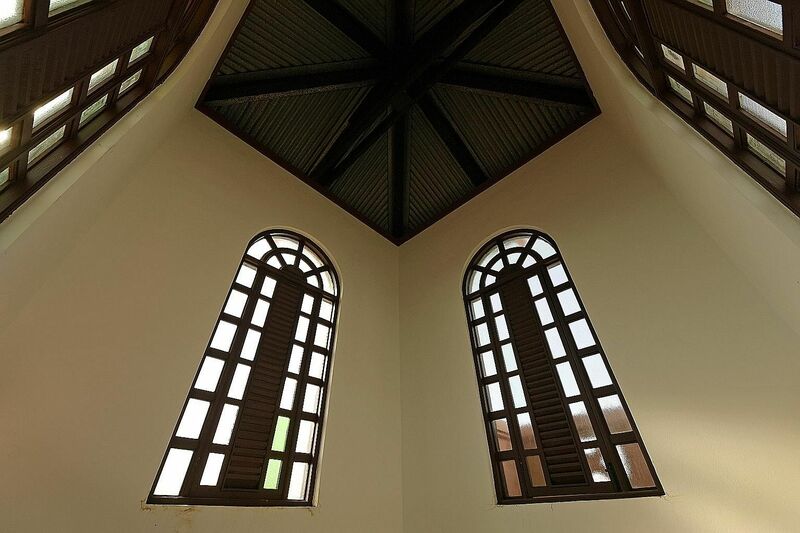 The windows also have casements that used to open from the top, providing protection from the elements and ventilation when it rained. "The old buildings were quite resilient in terms of environment - even if the fan was off, you could still use the room because it breathed. Newer buildings depend very much on air-conditioning," Mr Ang says. Another example of the building's simple, elegant and durable design is the timber doorframes that rest on granite blocks, preventing dampness from causing the wood to rot. •This is a monthly column on conservation buildings.